On Monday evening I had the privilege of hearing Prof. David Clines speak at Mandelbaum House. His presentation concerned the “failure” of the flood narrative in Genesis, and can be found (more or less entirely) here. It centred upon a few interrelated issues, focusing chiefly upon the theological absurdity of a creator-god who nullifies his own creation (thus nullifying, in a sense, himself), the heretofore unremarked literary phenomenon whereby the deity changes his mind twice (although I contest this, and shall remark upon this point in more detail shortly), and the moral vacuity of an all-powerful being who punishes sinfulness with genocide. To my mind, Prof. Clines spent decidedly too long on this third point, which was embellished with recourse to modern biblical commentaries and which vacillated between a condemnation of the ethics in Genesis and a critique of the surprisingly facile remarks of 20th-21st century scholars. “Too long”, I say, because we must seek to understand a text before rushing to judgment over it, and “too long” because who actually cares what 21st century commentators have to say anyway? If you are a 21st century commentator, please know that I don’t mean you. I’m sure you’re very interesting. And while I do like to read what people have to say (and well I might, if I expect anybody to read what I have to say), I have very little patience for people who wish to speak to me about their own personal ethical systems or their religious faith. By way of an example, I spend a great deal of my time studying mediaeval commentaries on rabbinic and biblical texts, and that is because those commentaries are interesting to me as subjects of study in their own right. When I read Ibn Ezra’s commentary on the Pentateuch, for example, I learn more about Ibn Ezra’s commentary than I do about the Pentateuch. When I study Rav Avraham of Bertinoro’s commentary on the Mishna, I learn more about his text than the one on which he is writing it. And that’s all well and good: I find both of those individuals, together with their texts, incredibly interesting. I don’t find many biblical scholars of the last two centuries worthy of study in their own right, but only insofar as they shed light to me on the object of their study. So far as their actual commentaries are concerned (and this critique holds true particularly for commentaries on Genesis) I would that they spent a little more time on the text itself and a little less on how it makes them feel. The most significant components of Clines’ address concerned the nullification of the creator god’s identity in the purposeful nullification of his creation, and the manner in which he is said to have changed his mind (twice, according to Clines; once only, in my opinion). The rabbis were sensitive to the first of these two issues in their claim that almost a thousand generations had preceded the creation of the first man – a claim variously interpreted as referring to the creation and destruction of a number of other earths in quick succession (so, for example, Midrash Tehillim 90:5; Chagigah 13b-14a). Rather than nullifying his role as creator of the world, the manner in which God aborts each experiment, erases it and starts again is construed as being very much in line with the nature of this role in the first place. I suspect that Clines would actually agree with this point; after all, he made reference to Jeremiah 18:4, in which the same verb (שחת) that is employed in Genesis to describe both the wickedness of humanity and God’s destruction of it is applied to the metaphorical potter, destroying his faulty handiwork. Is it Clines’ opinion that when the potter destroys a poorly-made product in order to start again he is somehow negating his role as artisan? And if not, why should God’s role be in any sense negated by a similar act? I will never again curse the ground because of humankind, for the inclination of the human heart is evil from youth; nor will I ever again destroy every living creature as I have done. As long as the earth endures, seedtime and harvest, cold and heat, summer and winter, day and night, shall not cease. The Lord saw that the wickedness of humankind was great in the earth, and that every inclination of the thoughts of their hearts was only evil continually. And the Lord was sorry that he had made humankind on the earth, and it grieved him to his heart. What is the difference, we might ask, between the inclination of human hearts being evil continually and the inclination of their hearts being evil from youth? None, I would suppose, and yet the similarity of these two verses to one another is only troublesome if you feel the need to posit that between the two of them God had changed his mind a second time and decided that humanity was worth preserving. He didn’t, and in the theology of Genesis 6-8 it is not. From start to finish, the humans who feature in this narrative are described as being nothing but a disappointment. Within its narrative context, their purpose was to tend to the earth that God had created and yet they have filled it with violence (חמס). As a result (or, in a rabbinic mode, “once again”), God sees fit to eradicate everything and start all over. And yet, we are told that he likes one particular person and he chooses to give him the benefit of the doubt. This assumption pays off, although it does not change what the deity thinks of the human species. Note that when God decides to eradicate all life on the planet, he singles out four categories of animal: humanity, beasts (בהמה), creeping things and birds (עוף). This list is found in 6:7, immediately after the passage that I quoted earlier, and comprises a convenient way of referring to all life on the planet. (We need not necessarily read anything into the omission of fish). Note as well that when God prepares an escape clause for Noah, he builds into it the possibility of the regeneration of each of these categories: Noah’s family gets to travel with him, as does a sample of every bird (עוף), beast (בהמה) and creeping thing – mentioned both in 6:20 and 7:2-3. Here, the text differentiates between clean and unclean animals: the first instance within it in which any moral or qualitative difference is applied to the rest of the animal kingdom. Once again, the rabbis were sensitive to this information, supposing that Noah needed to take seven of every clean animal and only two of the unclean since the clean animals were to be offered as sacrifices. In our haste to unravel a stratified text, biblical scholars have tended to glide over these observations, seeing further evidence here for there being two flood stories instead of one and assuming gross stupidity on the part of the final editor, who either failed to notice the incongruity or to ascribe it any significance if he did. On the contrary, since the passage ends with Noah’s offering a sacrifice of clean beasts (בהמה) and birds (עוף), and since this directly precedes God’s declaration that concerns his no longer bringing destruction on the planet – in fact, since God’s declaration is related directly to his having enjoyed the sacrificial aroma – the differentiation between clean and unclean animals cannot possibly be more relevant to the overall story. God’s instructing Noah as regards which were clean and which were unclean can be seen as an extension of his choosing to save this one man from the annihilation that is meted out to the rest of the planet, and is the reason that this choice pays off when all is said and done. God does not repent of having destroyed humans, since he persists in his description of them as being inclined perpetually towards evil. He does repent, however, of his decision to destroy the earth on account of humans, and it is the earth that he decides now to maintain in spite of their wickedness. Their saving grace, as a species, is an ability to utilise that earth in worshipping God – a notion that appears first in God’s acceptance of Abel’s animal sacrifice in 4:4. A miserable fellow, rather angry with the people who are tramping all over his creation, but one content to forgive and forget in exchange for a good meal. In the spirit of Purim, which begins at sundown this evening, I would like to share a piece of satire that must surely take its place as one of the greatest Purim parodies ever composed. It was shared by Dr Shai Secunda in 2012, although the author’s identity appears to be a carefully guarded secret. I am extremely impressed and would love to see more of his/her work! This piece is really just too good to be presented without any form of translation or commentary of my own, and I’ll admit to having spent quite some time enjoying it since it was first published online. The following constitutes my presentation of its very many highlights. The terminology here is reminiscent of the actual Mishna (“they state a rule”, “they state another rule”, “in actuality”, etc), and the content of the second rule pertains to an area of legislation that concerns the impurity conveyed by different types of corpses. Something’s being “in a tent” (either together with you, overhanging you in the manner of a tent or being underneath you with you forming a tent, so to speak, over it) is one of three ways that corpse impurity can be conveyed. The other two are those of touching something and of carrying it (perhaps upon a tray). The subject matter of the first rule sets the scene, being reminiscent of a political stunt at the conclusion of 2011, in which haredi children were dressed up as victims of the Shoah in order to protest the state’s treatment of its ultra-Orthodox citizens. The Rashi-style commentary on this mishna is for the most part straight to the point, but the explanation of this ruling (that all costumes are permissible except for those of the Holocaust) is brilliant: “you would think [based on this mishna] that those ones are forbidden due to derekh eretz” – a term that denotes tastefulness, propriety and the acceptable social morés of our society. On the contrary, the gemara commences by asking a question: Is this so? Behold, the pious ones (נקיי הדעת; Rashi: “the Eda haChareidis”) of Jerusalem dressed in Holocaust costumes! Rav Tuvia says: “All costumes are permissible except for those of the Holocaust, which are an obligation“. As the Rashi-style commentary explains, Rav Tuvia is a reference to Rabbi Yitzhak Tuvia Weiss, who is the head of the Eda haChareidis (and who has been since his predecessor’s death in 2003). Rashi’s comment concludes, however, by referencing a passage in the Talmud from פרק המדיר את האשה in Tractate Nedarim. המדיר את האשה (haMadir et-haIsha), in Mishnaic Hebrew, refers to prohibiting a woman from her husband by means of an oath. Taken on its own however, it is an allusion to the exclusion of women in general, both from public life and from positions of authority. The “Talmud” then continues to extrapolate from biblical texts precisely why dressing in Holocaust-related costumes might be construed as an obligation, deducing that it is in order to mourn for the work of the Zionists, who anger God as much as idolatry and murder. This last point is made in the name of Rav Aharon Hasida – Rav Aharon “the hasid”, that is: an allusion, of course, to Rabbi Aharon Roth. Reb Arleh (as he is known) was the founder and rebbe of Shomer Emunim, which has since split into Toldos Avraham Yitzhak and Toldos Aharon. The “Rashi” commentary here references Tractate Bava Maaseh in support of this observation! The Talmudic explication of the second rule within the mishna commences with a question: is it possible that all ears convey impurity in a tent? Have we not learnt that the ears of pigs and rabbits convey impurity by touching and by carrying only? To this, Rav Shakh responds by noting that the Zionists have already eaten all of the pigs and rabbits, and that (as is pointed out by Rabbah in Chullin 71a) a swallowed impurity does not further contaminate. Finally, the Talmudic analysis concludes with an explication of the Mishna’s third and final rule – that, “in actuality, they said: all rabbinic supervisions are invalid save for that of the Eda haChareidis”. According to Rav Rubin (an allusion to Rabbi Avraham Rubin, who heads the Edah’s kashrut authority: Badatz Mehadrin), this is to exclude the supervision of the Israeli rabbinate in particular. As “Rashi” points out, the hatred of the rabbinate has its source in the first chapter of Avot. This is a reference to Avot 1:10, in which Shemaiah declares that one should despise positions of authority (ושנא את הרבנות) – or, that one should “hate the rabbinate”. But is it not obvious that the supervision of the rabbinate is invalid? After all, the rabbinate is comprised of Zionists! Rather, says Rav Landau (perhaps an allusion to Rabbi Moshe Yehuda Leib Landau – the Av Beit Din of Bnei Brak), the mishna’s ruling is designed to exclude the supervision of Rav Ovadiah Yosef, whose bet din (in the Rashi-style commentary) is deemed a “permissible” bet din. And yet, this also poses problems to our gemara, since Rav Ovadiah was a Sephardi and should certainly excluded on those grounds as well. After all, the Torah says “Beit Yaakov” (Exodus 19:3), which would exclude all Sephardim! This passage (which can also be read as stating that “Beit Yaakov is to exclude all Sephardim!”) is an allusion, of course, to the school Beit Yaakov, in the Israeli settlement of Imanuel, which attracted some much-deserved notoriety in 2007 when they insisted on segregating girls of Sephardi families, leading to the allegation that they were seeking to exclude Sephardim altogether. This allusion is made even stronger by its being attributed to Rav Imanuel – which is to say, the rav of Imanuel. Taken as a whole, this is a truly beautiful piece – a somewhat brilliant piece – and I would be thoroughly remiss if I didn’t relate some of the hilarious passages found in the mock-Tosafot commentary on the left-hand side of the page. I encourage people to read it for themselves, and warn that the following may constitute a spoiler. Much of what they write (as with a great deal of what “Rashi” has to say here) is of a fairly literal nature, and the extent to which it is parodic hinges on its dealing with a fictitious mishna and a desire to harmonise it with other passages within the real (and, occasionally, fictitious) Talmud. In some cases they have tweaked those other passages in order to incorporate a condemnation of the Zionists – which is to say, of those who would condemn them in reality. Rabbi Yitzhak Elchanan gets a second mention as well, when the “Tosafot” go on to question the gemara’s usage of a verse in Jeremiah, wondering whether or not there could have been Zionists during the time of that prophet. This passage is a lovely combination of the literal and the absurd (perhaps of the literally absurd), in that it both comprises a serious attempt at tosafist-like pilpul, while at the same time serving as a deliberate parody of the texts that it is quoting. In that regard, it references the conclusion of Tractate Sotah, which laments the deaths of individual rabbonim by remarking upon the decline of the generations since their passing and the concomitant increase of troubles. The quote, however, is a fabricated one: “since the death of Rabbi Yitzhak Elchanan [Spektor], the Zionists have increased”. If the Zionists have increased, there must have been some Zionists even before Rav Yitzhak Elchanan, and so possibly even in the days of Jeremiah? The cleverest passage in my opinion is their second-to-last one, which concerns the exclusion of Rav Ovadiah’s kashrut supervision. There, while referencing a non-existent tractate (there is no Talmud on Tractate Uqtzin), “Tosafot” puzzle over a logical inconsistency in the invented Talmud to their right. Rav Ovadiah is to be excluded because he was Sephardi, and yet Rav Ovadiah was also in the Israeli rabbinate! Rav Ovadiah’s inclusion in the rabbinate (of which he served, for a time, as Chief Rabbi) is proven by means of an invented passage that makes reference to the stellar work that he did in releasing agunot and in “repairing” mamzerim, together with the absence of all such work in the years since his appointment. In the words of this passage, “Since I became Chief Rabbi, I did not permit a mamzer” (כד הוינא רב הראשי לא שרינא ממזירי). Since the “Talmud” does not exclude Rav Ovadiah’s supervision for the obvious reason (being that he was head of the Israeli rabbinate), and since it relies instead on the less obvious reason of his not being Ashkenazi, the Tosafot-style commentary concludes brilliantly: there must be two Rav Ovadiahs. Other highlights, which you can read for yourself, include their reference to secular Israelis being lenient on sandals but strict on socks, and on their inclusion of a well-known Israeli anti-joke that involves two elephants in a bathtub. But perhaps the part that made me laugh most of all was in the very conclusion of the Talmudic section, and its “teaser” (so to speak) as to what the next page concerns. The Mishna there commences with six words (found more fully in “Rashi”, on the right) to the effect that “all spittings are permissible, save for the spitting of women”. Again, the language here is thoroughly reminiscent of the actual Mishna (see, for example, Sheqalim 8:1), but the suggested allusion is to the disgusting incidents that transpired in Bet Shemesh just a couple of years ago. This is borne out by the Rashi-style commentary, which commences by noting that “you might think that [“the spitting of women” refers to] women who spit…”, and yet we suspect it refers to something far uglier than that. Yes, I laughed out loud, and yes I know that it’s an atrocious thing to laugh at. But then, isn’t that the point of this piece as a whole – and the point of Purim parodies in general? After all, the very origin story of Purim is incredibly funny and has more than its fair share of the horrific. For my taste, if I ever find a finer Purim parody than this one I shall be most impressed. The work that went into creating this is astonishing to me, and I am not in the least embarrassed by how much time I have spent reading it. It was time thoroughly well spent. Wishing you all a very happy Purim, and one with lots of laughter. R’ Dr. Tuvia Levenstein (4:34). And while I’m sharing videos, here are three of my favourites. The first is a famous one, since it commences with footage of the Munkaczer Rebbe at his daughter’s wedding in 1933. Unlike that video, the second and third ones are silent, but while the second is in black-and-white (and is shot in pre-war Ukraine) the third is in colour. It was filmed by Dr. Benjamin Gasul in Warsaw, 1939. Picture the following scenario. A young man, enamoured of Torah, encounters the commentary of the Ramban. Lucid, straightforward and with an almost categorical precision, yet mystical and permitting of ceaseless interpretation. He’s hooked, and he purchases a copy. Undeterred by the fact that he has never before read the chumash, he immediately sets out to learn it with the Ramban, and he commences with the very first verse. Six words in Hebrew, followed by a few hundred words of Hebrew commentary. He reads those six words, thinks about them a little, makes sure that he understands (or thinks that he understands) what each of them means, and then spends several hours wrestling with the Ramban’s interpretation before moving on to the second verse. But the second verse features no comment from the Ramban! Obviously, there’s no need to learn this passuk and he skips it altogether, moving on instead to the third. In such a fashion, he progresses through the five books of the Torah: skipping verses on which the Ramban leaves no comment, and merely reading those verses on which he does. Since the Ramban’s commentary deals at length with ideas contained within the verses on which he does not remark, even reading the text in so haphazard a fashion will still enable the diligent student to at least encounter every (or almost every) verse in the Torah. So, when he comes to the end of this enterprise, what will he have achieved? It would be foolish to say “nothing”, since it is impossible to read a text the size and scope of the Ramban’s commentary on Torah and to not learn a thing, but to pretend that he has at all studied that text would be no less ridiculous. After all, the Ramban’s commentary on the Torah is a commentary on the Torah, and the only way to properly engage with a commentary is to study first the text on which it serves as one. By skipping those verses that lack the Ramban and only cursorily engaging with those verses that do, our student will not only fail to learn Torah, he will also and as a direct result fail to grasp the Ramban’s commentary on it. If you think that this scenario sounds absurd, it is no different to the Talmudic methodology adopted in every major yeshiva. There, students commence their study of every sugya with a reading of its introductory mishna. They make sure that they understand (or think they understand) the mishna’s words, they have a look at the issues with the mishna that Rashi raises, and then they proceed to spend several hours (perhaps days, or even weeks) wrestling with its gemara. And well they should: the Talmud, as a text, is both larger and more complex than the Mishna – to an order of magnitude. But have they really learnt the gemara? After all, the gemara serves as a commentary upon the Mishna, and unless one actually studies first the text on which it is based, how can one expect to walk away with a proper understanding of either? I first asked this question in 2002, when it initially became apparent to me that “we were doing it all wrong”. If a student’s only encounter with the Mishna was with the few lines that served as a preface to the text that he was really studying, is it not the case that he is really studying neither? Like the Ramban’s commentary on the Torah, the Talmud doesn’t feature gemara on every single mishna, and while almost every mishna might be mentioned at some point within it, the rabbinic endeavour presupposes familiarity with the text as a whole. Should not more time be devoted to a serious, analytical study of the early rabbinic literature on its own merits, before delving into the sprawling, complex and systematic commentaries upon it? And the flabbergasting answer that I received (not once, but twice, and at two separate institutions) was, Yes. Of course! But who has the time? You do, is what I should have answered. If it is your job to study Torah, then you absolutely have the time to do it properly. But I did not. I accepted their answer: all things being equal, if I could only study one thing, I would make it the gemara. And to those who lack the time to study anything else, the gemara is a worthwhile choice. It contains both law and philosophy in equal measure, and might amply be described as the root and stock of rabbinic Judaism. But those who do have the time – whether they learn in kollel, or whether they simply devote a few hours each day to serious study – have no excuse for neglecting the Mishna, save that their teachers taught them to do so. 5774 was an incredible year for me. In November of that year, which was 2013 by the Gregorian calendar, I received a phone call from “the university” while holidaying with Ariella in Melbourne. It turns out that the thesis that I had not yet started to research nor to write was due to be submitted, and that no further possibility of deferral would be extended to me. Way to ruin a vacation. Still, there are some vacations that cannot be so easily spoilt, and the one that was approaching fell thoroughly into that category. It commenced on Boxing Day, when my immediate family and I (with the delightful Ariella in tow) flew to Cape Town for my brother’s wedding. He was to be making official his long-standing relationship with the love of his life, his highschool sweetheart and the mother of his beautiful little boy, and since they are both so enamoured of the culture of that continent, they had picked an African location. We spent ten days in Cape Town eating meat and seafood, basking in the thick sunlight, canyoning through ravines, climbing up Table Mountain, hiking through the dense forest, relaxing in the Botanical Gardens of Kirstenbosch, walking the old township and having a generally fabulous time. Even weighed down with books on metaphor theory and their application to biblical studies, nothing could dampen my spirit. Having exhausted so much of what Cape Town had to offer, we then flew to Johannesburg and caught a shuttle bus up north. After a six-hour drive we had arrived at Madikwe game reserve, where we spent the next few days and where my brother was married. Once again, I was truly honoured to have been mesader qiddushin, and to have fulfilled those duties in such a beautiful and exotic location. We saw herds of impala and zebra, a great many elephants, two ferocious lions, a lioness, several giraffes, rhinos and buffalo, and a tremendous number of birds. On the evening before the wedding, we had dinner under the stars, surrounded by trees and by rangers with guns, where we feasted on the flesh of Madikwe’s former four-legged residents. This part of the vacation over, we drove back to Johannesburg and caught a flight to Victoria Falls, Zimbabwe. There we spent two days white-water rafting, hiking along the waterfall and eating feasts of epic proportions. It was sad to leave, but leave we must, and our next stop was Chobe National Park in Botswana, where we added to our list of wildlife an abundance of hippos, several crocodiles, more wild dogs and a cheetah. In July, when the thesis was finally beginning to take shape and the deadline was little more than a month away, Ariella and I flew to Helsinki with her parents, and there I met the rest of her family. Her brother, who is married to a Finnish girl, lives in Helsinki with his wife and their two beautiful children, and for two weeks we strolled and shopped, kayaked and ate, and I tried to write more of my thesis. Towards the end of the holiday, Ariella and I made a brief stopover in Paris for three nights, where we got to feel like Europeans, catching flights and trains without need of a passport and with only enough luggage to see us through a few days. They were some of the most wonderful days of my life: we spent approximately eight hours on each of them walking, stopping only to fill up on cheese, cured meats, red wine and roast duck. The snails, which I ate on the first night and on the third, were magnificent, and the Jewish quarter was like a slice out of time. On our return to Sydney, I commenced the traumatic period of thesis-writing, in which I didn’t leave the apartment, barely slept and wrote for over twelve hours a day. That culminated in an awful fortnight, at the conclusion of which I reeled into the university printery, produced five copies of the finished product, submitted four of them and tried not to have a nervous breakdown. When Rosh haShana approached once more and 5774 morphed into 5775, so too did Ariella (without whom my thesis would still be unwritten) morph from being my girlfriend into being my fiancée. We made the announcement in Melbourne, shortly after Yom Kippur, and had an impromptu lechayim for all of her 150+ family and friends (including a handful of my own people, there to toast the end of my long bachelorhood). While that concluded 5774, I feel that a word or two should be said for the beginning of 5775, at which Ariella and I (who both believe in short engagements) got married at the home of my parents. Ariella’s father, who is both a Torah scholar and a tzaddik, honoured us both by being mesader qiddushin, and we custom-designed the marital proceedings ourselves. Put simply, we separated the eirusin from the nisuin by an hour, such that qabbalat panim was followed by Ariella circling me seven times, my giving her a ring and her father reciting two berakhot. While our guests ate, she and I (together with her father and our two witnesses) filled out and signed the beautiful ketubah that my parents had given us. Then, we returned downstairs for the chuppah, at which I wore a kittel and was given a new tallis by Ariella’s parents. I put it on, made a shehechiyanu, was given a ring by Ariella, draped the tallis over the two us for the seven berakhot and then stomped on a glass. The following week was spent in Melbourne, where we had sheva berakhot almost every day, and where we turned our one-day wedding into a seven-day feast. I look back now and I am amazed at how much has changed over so short a time. One of my two sisters is married and is due to have her first baby soon; one of my two brothers is married and now has a second baby boy; my thesis has finally been submitted, and I find myself married to the love of my life; and – as of only two days ago – my other sister is engaged! I really don’t know what this year will bring, but it will be pretty hard to top the last. A little while ago, David Curwin over at Balashon mused upon the etymology of cholent. He offered a variety of different suggestions, and is no doubt correct in relegating all of them (or almost all of them) to the status of “folk etymologies” (“etymythologies”, as I have heard one scholar put it). He does not note, although perhaps should, that the earliest reference in text to this food as “cholent” (known by Sephardim as chamin, “hot food”) is in the 13th century Or Zarua II:8, by Rabbi Yitzhak of Vienna, who mentions it in relation to the Jews of France. Whether or not that lends itself to one of the etymologies that derive the word from French, I cannot say. Reference to cholent is fairly ancient, even if the Franco-Yiddish terminology cannot be traced back before the 13th century. In fact, not only is it ancient but it is something of a cause célèbre in rabbinic circles. While the Torah does not expressly forbid cooking on Shabbat, it does prohibit the lighting of a fire. What is more, the textual proximity of the description of the tabernacle’s construction to a repeated stipulation that concerns resting on the seventh day was enough to suggest that anything required for the former must be prohibited on the latter. And, since the preparation of dyes for the tapestries required a process of heating and stirring, that effectively prohibits cooking on Shabbat. While one might need to be a rabbinic Jew to accept the logic underlying this conclusion, one certainly need not be a rabbinic Jew to accept the conclusion itself. In fact, all available evidence would suggest that non-rabbinic Jews also abstained from cooking on the seventh day, be it for any reason other than the most obvious one: that cooking simply feels like “work”. This is where things get a little complicated, since the rabbinic predilection for casuistry has resulted in careful delineations of precisely which aspects of cooking are to be so labelled. And while stirring is indeed a problem, in the event that the food is already at least one-third cooked, and so long as it is placed upon the flame before Shabbat has come in, and so long as one does absolutely nothing to adjust the flame in any way, to change the rate at which the food is being heated or to add anything further to it, it will be possible to eat a nice, hot meal for Shabbat lunch. Understandly, this is something that non-rabbinic Jews can simply not accept. And equally understandably, the decision to make cholent has come to be viewed as a powerful statement as regards one’s faith in the rabbinic sages. As such, Rabbi Zerachiah haLevi of Gerona, in his 12th century commentary to Rabbi Yitzhak Alfasi’s Sefer haHalakhot, declares that all those who abstain from eating cholent should check their lineage, lest they turn out to be descended of sectarians! No doubt he had in mind the anti-rabbinic Karaites, who at the time that he was writing comprised some 40% of the world’s Jewish population, and with whom the rabbis frequently engaged in heated polemics of this nature. Only those who do eat cholent, Rabbi Zerachiah haLevi continues, are to be considered believers, and it is only they who will merit to see the end of days (Maor haQatan, Shabbat 38b). We are commanded to cover [hot vessels] in advance of Shabbat, that we might eat hot food [chamin] on Shabbat, since this is [a fulfillment of the twin commandments of] honouring and delighting in Shabbat. And anyone who does not believe in the words of the sages and who forbids the consumption of hot food on Shabbat is suspected of being an apikorus. The apikorus is a curious category of person, but for all practical purposes he (or she) is somebody who has forfeited their right to inherit the world to come (mSanhedrin 10:1). The suggestion that one might be suspected of being an apikorus on no stronger ground than an aversion to cholent is a powerful one, but it is not the fiercest statement made in cholent’s defence. That dubious honour belongs to another contemporary of the Shulchan Arukh: Rabbi Mordekhai Yoffe. One of a number of people who disliked the Shulchan Arukh, Rabbi Yoffe is almost alone in having utilised his dissatisfaction with the text to produce an alternative. It is known as Levush Malkhut and it spans ten volumes, the first five of which only are devoted to an exposition of rabbinic law. To properly understand the nature of this work, it is important to appreciate that it effectively functions as a commentary upon another. The text that serves as its foundation is the monumental Arba’ah Turim of Rabbi Yaakov ben Asher: a 13th century German scholar, who condensed all of rabbinic law into four broad categories – the first of which, “Orach Chayim”, covers the laws of Shabbat (amongst other things). Rabbi Mordekhai Yoffe was far from being the only person to have authored a commentary on this magisterial work. 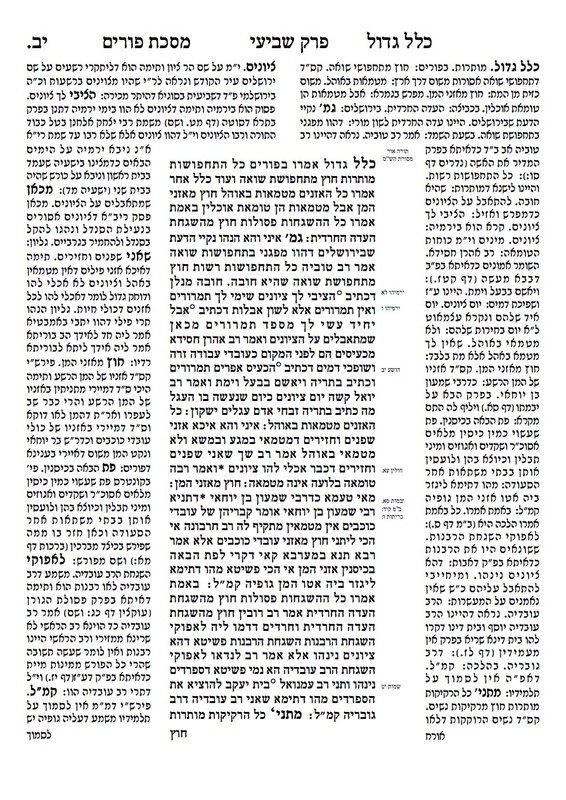 Rabbi Moshe Isserles, whom we have already mentioned, wrote a commentary on the Tur called Darkhei Moshe. And Rabbi Yosef Caro, who was later to pen the Shulchan Arukh, wrote a commentary on the Tur called Beit Yosef. The Beit Yosef is a vast and thoroughly comprehensive exposition of rabbinic law – too vast for the average person to make good use of, and more comprehensive than a text of that nature may be required to be. It is a tremendous resource and encyclopedic in scope, but thoroughly in need of an abridgement. Rabbi Caro’s Shulchan Arukh is precisely that abridgement: an expurgated and abbreviated version of his Beit Yosef, designed for easier use. It was the opinion of the Levush that this abridgement was a little too abbreviated, and he sought to create a work of Jewish law that would fall midway between the Beit Yosef and the Shulchan Arukh: a commentary, in other words, upon the Tur that would not be too encyclopedic, but would neither be too casual in its presentation of the sources. We are commanded to cover [hot vessels] for the sake of Shabbat, that we might eat hot food on Shabbat, and this is [a fulfillment of the twin commandments of] honouring and delighting in Shabbat. And anybody who casts aspersions on the covering up of hot food [chamin] in advance of Shabbat, since he does not wish to eat hot food on Shabbat – for the reason that he considers it to be cooking on Shabbat – and who does not believe in the words of the sages is called a sectarian and one who scorns the words of the sages, and is deserving of death. But one who is pained by eating hot food, and for whom eating cold food is enjoyable, should not cause anguish to himself by eating hot food. Concerning somebody who under these circumstances doesn’t eat cold food, scripture states: an idiot walks in darkness (Ecclesiastes 2:14). Who would have known that cholent could be so polemical!